Marcus Porcius Cato (Latin: M·PORCIVS·M·F·CATO) (234 BC, Tusculum–149 BC) was a Roman statesman, surnamed the Censor (Censorius), Sapiens, Priscus, or the Elder (Major), to distinguish him from Cato the Younger (his great-grandson). He came of an ancient Plebeian family who all were noted for some military service but not for the discharge of the higher civil offices. He was bred, after the manner of his Latin forefathers, to agriculture, to which he devoted himself when not engaged in military service. But, having attracted the notice of Lucius Valerius Flaccus, he was brought to Rome, and successively held the offices of Cursus Honorum: Tribune (214 BC), Quaestor (204 BC), Aedile (199 BC), Praetor (198 BC), Consul (195 BC) together with his old patron, and finally Censor (184 BC). Late in life, he encouraged the Romans to start the Third Punic War to destroy Carthage. 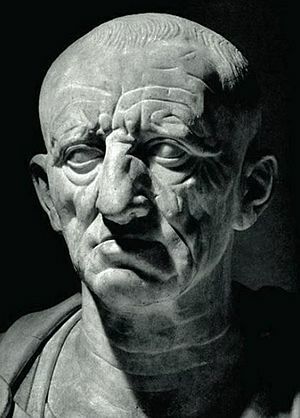 Cato the Elder Facts for Kids. Kiddle Encyclopedia.